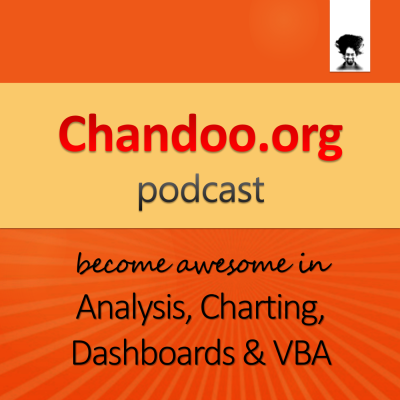 I am super-excited to tell you that Chandoo.org Podcast will be launching on 6th of March (Thursday). First episode is already recorded and I am getting ready for the big launch. Last week I asked you what should we call our podcast. And I got more than 250 suggestions (150+ thru comments another 100 thru email). While the suggestions ranged from funny (chanpoo, addict.xls) to word plays (Excelent show, Lord of the cells, Speaking Cells) to outright brilliant (XL.AM remember AM radio?). Some of the suggestions were crazy too – like, Word on the sheet, YouChandooIt, Didasko.xlsx – greek word “to impart knowledge”. A majority of you suggested that we call it Chandoo.org Podcast. This keeps the name generic, sticks to our brand and sets us apart. So that is what we will call it. Here is the album art for Chandoo.org Podcast. It tells you what to expect from the show. That is right. I just finished recording the first episode of this podcast. It will be out on Thursday, 6th of March. Thank you so much for encouraging me and Chandoo.org. Your support made me stronger and helped me launch this podcast. I will strive hard to keep our show as awesome as everything else on Chandoo.org. Thank you. Your hair better look just like in the photo above, or I refuse to watch. Or maybe I'll just turn the monitor upside down so that you're hanging upside down and gravity can do it's thing on your fine locks. Granted I'll have to then stand on my head so that the picture is the right way up. Hi, the name really suits with the name already established. Will it only work on ipod. will it not work on java mobiles. You can listen to it on our website. If your phone can play mp3 files, download and copy it. That simple. Congratulations, will try to download and listen on the plane home Friday! Contratz Chandoo. Cant wait for 1st Podcast. Just download the file that Chandoo puts on Website. If you download the file as MP3, you would be able to listen to it on any MP3 device, Tablet, PC, Phones etc. Can the podcast be available only thru apple and itunes. Is there any possibility that it can be heard in Samsung. Please download stitcher app from andriod playstore. Then add our podcast (search for chandoo) in that app. That simple!